Students will demonstrate the ability to create the illusion of space by overlapping shapes. Students will recognize the differences between art materials, techniques, and processes. Student will demonstrate the influence of personal experience in the process of making art. Students will demonstrate knowledge and skill of various art materials and methods. Explore an idea in different media - compare and contrast results. Demonstrate basic weaving technique - by weaving two works together. Examples of Rousseau’s work, Plants or Plant, References, Animal References--National Geographic and Ranger Rick are great. This lesson focuses on creating the illusion of depth by overlapping shapes. The work of Henri Rousseau is used to illustrate the idea. This project involves drawing, coloring, painting, and weaving. Spend time looking at Rousseau's work. I concentrate largely on his "jungle" paintings. His work usually can be easily divided into foreground, middle ground, and background. His illusion of space is accomplished largely by overlapping shapes. My mantra during this lesson is, "things in front, things in the middle, and things in back." Demonstrate this principle with a quick drawing. Many of Rousseau’s pieces have an object that emerges from the bottom of the picture plane to draw the viewer into the scene. Also, the sky is usually broken by the intrusion of plants and leaves. I point these observations out to the students and help them see that these elements add interest to the work. Finally, my students have been fascinated by stories from Rousseau’s life. Spend time just talking about Rousseau as a person. I stress the fact that much of his work is entirely imaginary. His main sources for visual information for these "jungle" scenes came from the library, botanical gardens and the zoo. He was not afraid to take visual liberties…his banana trees look nothing like the real thing. Kids begin drawing their personal, imaginary jungle. They must demonstrate an understanding of creating space by overlapping shapes. "Things in front, things in the middle, and things in back." I have various plants in the classroom. Kids can look at these plants for a visual reference to help them get started. I also encourage them to include at least one animal and something about themselves. For example, a basketball court was added in some jungles. Most importantly, I tell them not to include minuscule detail in the initial drawing. Students will be coloring the scene with crayon and painting the scene with 1 inch brushes. I have the kids do a one period "rough draft" drawing on 12 x 18 (30.5 x 46 cm) newsprint. Then, I have the kids draw their scene on a 12 x 18 inch (30.5 x 46 cm) white construction paper. Then they transfer the drawing to a piece of 12 x 18 inch (30.5 x 46 cm) green construction paper using transfer paper. The later will be painted with tempera. The drawing on white paper is then colored using wax crayons. Color heavily with crayons. A tempera resist will be applied after coloring. I usually emphasize blending colors over the surface of a tree or leaf. I tell kids they must press hard as they color and blend. Some kids complain their fingers hurt. I reply, "Great, that’s the only way you know that it is working." They return to their work more motivated. Black tempera is brushed over for resist (sponge off excess paint). When dry, students measure off ½ in strips along the width on the back of the work (approx 17 inches [43 cm] long). Make sure a ½ to ¾ inch (1.3 - 1.9 cm) border is left at the ends to keep the strips connected (draw border at each end of the paper). This will become the "warp" in the weaving. 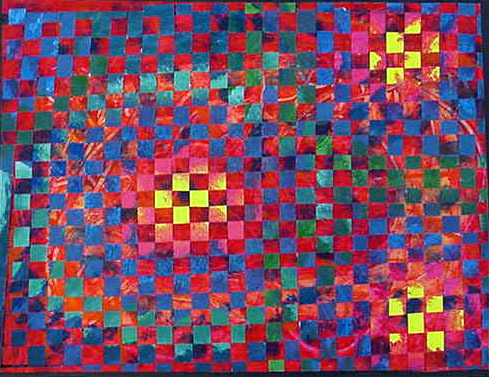 (Cut crayon colored drawing with X-acto knife and ruler -- Or fold and cut with scissors up to border line) Students may want to move on to the painting process and return to cutting the warp while their paintings are drying. The drawing on the green paper is now painted with tempera paint. Students are not allowed to use anything smaller than a 1 inch (2.5 cm) brush. I emphasize that objects should exhibit good contrast and let them paint for a period or two. After the painting is dry, students measure off 12 inch by ½ inch (30.5 x 1.3 cm) strips over the back of the entire paper. This will be the "weft" in the weaving. Make sure they number the strips before any cutting takes place!!! This way they can weave the strips in order into the colored/resist work. I would recommend only cutting a few strips at a time and weaving those before more are cut. Students begin to weave. The first painting strip that would go where "warp" is attached is saved for last. The students who were conscientious and made "smooth" cuts with scissors will have the least problems weaving. They will have to discard a few on the 12 inch (30.5 cm) strips so the 2 compositions will line-up (or cut a little off every other strip as they weave). Help them understand the goal is to weave the 2 pictures together, matching as much as possible. They should press each strip tight against the strip above and then secure it with a few drops of white glue. Kids may have to discard a strip or 2 during the process. Help them understand why and leave the decision to them. Once the weaving is complete - the ends (the borders) of the warp can be cut and the last strips woven in - and glued in place. The final step is to accent areas with oil pastels. Critique finished work. Compare and contrast how the two mediums worked. Did students demonstrate the illusion of space by overlapping shapes? Did students include their personal experience in the composition? 12" x 18" (30.5 x 46 cm) heavy white Drawing Paper (or white Tag board ), Tempera Paint , Brushes (larger sizes work best), Mixing Trays , water buckets, Scissors , Rulers , Drawing Pencils . 1. Create two non-objective compositions using shape. Emphasize different brush strokes. Explore color planning. Learn color theory. 2. Weave non-objective compositions together to create a new work of art. Note the texturalinterest and pattern that results. 3. Have students paint to a variety of music - express the music through color, line and shape. (Comprehensive Arts - integrate music into the visual art curriculum. Work of various non-objective and abstract artists who worked with music: Paul Klee, Piet Mondrian, Sonia and Robert Delauney, Jackson Pollock, Wassily Kandinsky (inspired by Stravinsky), Stuart Davis, and Bridget Riley. 1. Show a selection of non-objective works. Critique using the elements and principles of design. Discuss how they show rhythm and mood. 2. Play different kinds of music for the students and have them paint to music. Tell them they will paint two compositions. One may be mainly cool colors - one may be mainly warm colors. OR one may be mainly one compliment and the other mainly another complimentary color (see examples). Try a variety of brush strokes. Create some interesting shapes. 3. Demonstrate weaving technique when paintings are dry. 1. Paint two contrasting paintings. Paint to two different styles of music. 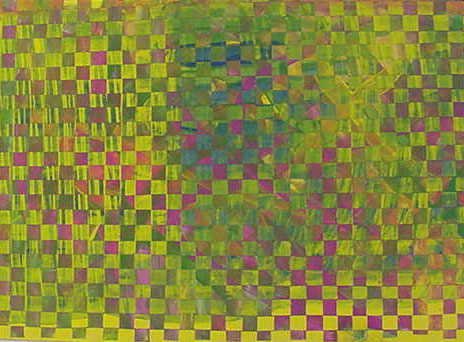 For example -- 2 paintings using complements and then weave those together...lavender purple as a dominant color and lime green as the dominant color (see example) OR -- have them contrast the kind of brush strokes. OR -- have them contrast cool and warm (see example). OR -- have them contrast shapes etc. 3. Mark back of second painting - measuring at ½ inch intervals by 12" (younger students may want to make them wider). Number strips on back so weaving is done in order (save first ½" strip till last). Cut off a few strips at a time for weaving. Weave in a tradition tabby weave. When finished - the border may be cut and the final strips woven in, if desired. Glue ends to secure -- or tape on back side. 4. Mount on black paper to bring out the colors. 1. Did students show the expressive qualities of the music through color, shape and brush strokes? 2. Did students show understanding of color theory through choices of color for their paintings? 3. 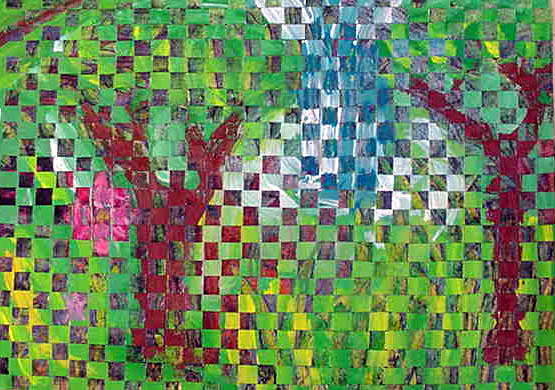 Did students successfully weave two paintings together to create a different composition?